Leopard slug (Limax maximus) in Ambrose Park, Reno. May 2015. Photo: K.McCutcheon. 4 to 8 inches long. Spots on the mantle (upper back), stripes on the tail. The Leopard slug, also called the Giant garden slug, is a type of Mollusc, a distant relative of the octopus, squid and snail. The Leopard slug is native to Europe and parts of Northern Africa, but has been introduced to North America, where it is often found living in close association with humans — in gardens, greenhouses and parks (McDonnell et al. 2009). Slugs have two sets of tentacles on their heads: The upper set are used to sense light, and have eye-spots on the ends. The lower set are used to sense smells. Slugs breathe out of a hole in the side of the mantle (the upper back), called a pneumostome. Slugs secrete a layer of mucus as they move, which protects the foot from damage (White-McLean 2011). The mucus also helps protect the slug from drying out, especially important in arid climates like that of the Truckee River region. Leopard slugs are nocturnal, and feed on decaying plant material, fungi, and sometimes other slugs (McDonnel et al. 2009). To find them during the day, look under logs or rocks in damp areas. Slugs are eaten by many species of birds, fish, reptiles, amphibians and mammals. To reproduce, Leopard slugs suspend themselves from a tree branch by a piece of very strong mucus, and mate while hanging in the air! They are hermaphrodites (like all slugs), with both male and female genetalia. Each slug exchanges sperm, then each slug will lay eggs. Here is a clip of a David Attenborough video that shows the process — beautiful and completely disgusting, all at once. 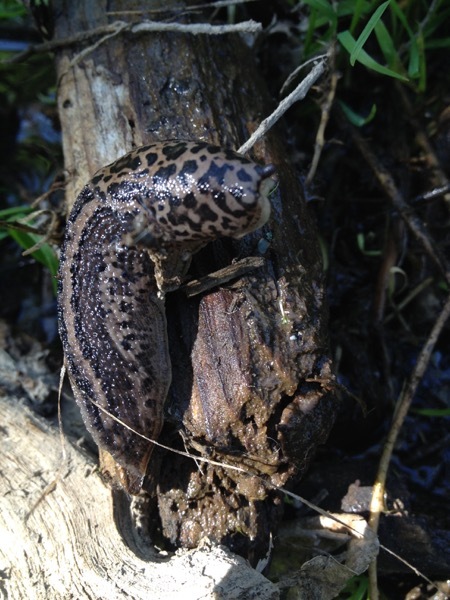 Along the Truckee River, one Leopard Slug was documented in Ambrose Park in Reno during May of 2015. If you see another, please submit an observation! Do you have information on Leopard Slugs, or original photographs taken locally? If so, please contribute photos and observations here, or email information to kelseymccutcheon@gmail.com. Thanks! How cool! The pattern is just like a leopard; convergent evolution? I didn’t know Reno can support slugs, it gets so cold here.